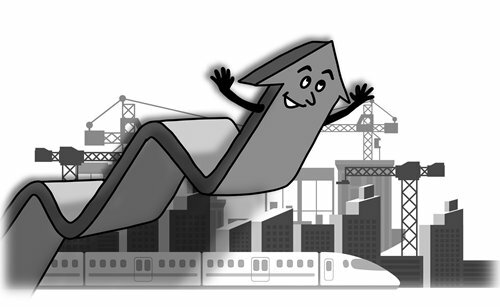 Following careful and substantive fiscal and monetary pump-priming, China's economy is regaining traction, as the country's newest statistics reported cozy 6.4 percent GDP growth for the first three months of 2019. A massive stimulus package, increasing investment and output of high-tech industrial lines have fired up the once sputtering engine. With Beijing's growth-boosting policy portfolio taking time to kick in over the coming months, Chinese officials and economists have confidence that the world's second largest economy is likely to accelerate at a rate higher than 6.4 percent in the next three quarters. In early March, the State Council, China's cabinet, set a growth target for this year of 6-6.5 percent in its government work report to the people. That target is within easy reach. The upbeat growth data for China will buoy up global markets, but it won't cheer everybody up. Over the weekend, a rare telephone talk between US President Donald Trump and former president Jimmy Carter revealed that the sitting president is worried about China "getting ahead of" America. According to US media reports, Carter told Trump that the US government needs to slash defense spending to save more of its budget for its civilian sectors. Trump ought to heed this piece of advice. Here is another recommendation for the Trump administration: for the good of the US economy and the world at large, the US should dismiss unilateralism and end its protectionist economic policy. Over the past 12 months, the tariff war with China and other major economies - including the EU, Japan, India and Russia - has not only crippled other economies, but also seriously bruised the US economy. Most economists would agree that with Trump's "America First" policy poised to linger on, global uncertainties are here to stay. To ward off the distress, Chinese policymakers must not slacken but must keep calm, vigilant and agile to extend its toolbox and deliver the best remedy to keep China's economy on a relatively fast track. According to mainstream economics, a stimulus plan is indispensable for jumpstarting a sudden slowdown or recession, as the world witnessed with the colossal quantitative easing by the US Federal Reserve in the aftermath of the 2008-09 financial crisis. Luckily, there are rising signs that the governments of the US and China are inching closer to a trade deal. However, if the US remains stuck in its protectionist trench or escalates the tariff war, China should be ready to scale up the current stimulus. Since the beginning of 2018, China's central bank has reduced the banks' reserve requirement ratios (RRR) five times in order to free up more capital for lending and, at the same time, guided interbank interest rates to a lower level to cut financing costs for all types of enterprises, private firms in particular. China's banks issued a record 5.8 trillion yuan ($867 billion) in the first quarter this year. Additionally, the State Council has worked out a package to cut corporate taxes and fees by up to 2 trillion yuan a year. China has more room to cut RRR and reach into the coffers to ratchet up fiscal spending. The country could remain persistent in investing in new technology so that it always sits on the tide of future opportunities and grabs the high-paying jobs of the future. Thanks to rising investment, a wide range of new industrial lines are springing up, led by high-speed train systems, advanced-reactor nuclear power stations, a homegrown satellite positioning system, 4G and 5G equipment and device plants, big data and artificial intelligence ventures, robotics, and the domestic semiconductor industry. Thanks to the government directive to strengthen private internet business, the number of people in China connected to 4G mobile networks is reaching 950 million - three times the US population. The so-called "Internet Plus" market is extraordinarily massive, dynamic and innovative. It supports the world's largest market for mobile shopping, cashless payment, and internet-based sharing businesses in car-hailing, courier delivery, social media and tourism. NBS reported that retail sales for March rose 8.6 percent, faster than January and February, while online retail raked in double-digit growth in the first quarter. China also needs to be firm in implementing the Belt and Road Initiative (BRI). The policy's benefits are two-pronged, as it will direct capital and Chinese experience and knowledge to help recipient countries develop their economies, while China's trade with BRI participant economies will grow as these countries become well off. After all, through enhanced imports and exports, both China and BRI countries will continue to prosper. This is another reason the Trump administration has been throwing mud on the BRI.